These DIY hanging planters cost me $10.00 each and an afternoon in the sun. Hunt for them on Etsy, or even on google and you might be shocked to find out that you can make them for about 90% less if you build them yourself. I have no problem paying for craftsmanship, better wood (if I can find it) or even expensive shipping if I want something. But when I know I can crank out something that looks similar for less than half the price; you better believe I am going to bring out the big saws to get it done. I also seem to have a thing for making my planters; I have this post where I make a window box planter from some cheap wooden shims. Supplies Required – This list will make 2 planters. One pine board 24x48x3/4 inch. I found mine at home depot in the aisle with the pine project boards- this board will make two planters. also on Amazon. I used a coupon at Michaels and bought 100 feet for $5.00.
. I did find mine at the hardware store for less than a dollar each. The first step is cutting the wood. Now you have to get your angles right, or this project never comes together well. 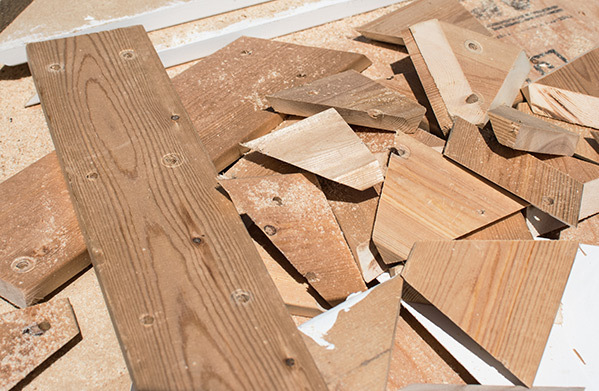 My husband and I have both cut our fair share of wood during our fixer-upper renovation. From the easy to the hard to the downright frustrating, the worse projects by far were the compound miter projects. So imagine the look on his face when I point to a picture on a screen and say “these” I want to make these. 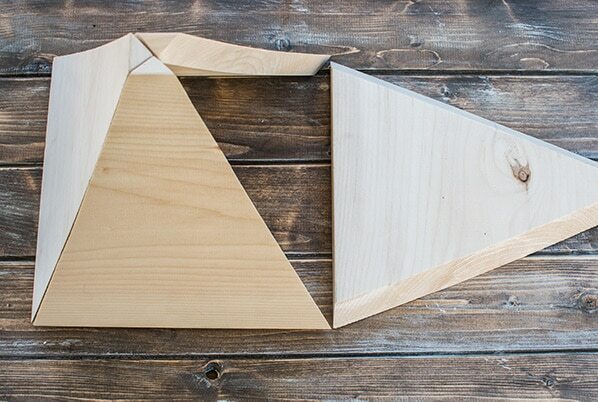 A DIY hanging planter made entirely with compound miter cuts. His response was darling, but I can’t share it here. See the test wood below – he loves me. A few starting tips that make the job go a bit easier. It took a bit to get the angles cut right and have everything fit into place, once the angles were right, we were able to make a few fairly quickly. But you need to know a few things before you start. #1. Make sure you choose a board that is straight with no warping. Any warping of the board will cause issues when you try to fit the pieces together. #2. Set the angles on your saw and use some scrap wood to test the cuts. The width of the test cuts does not matter because these planters scale in height. You could use a 6-inch board, or a 12 -inch board and still end up with a planter that fits together. #3. 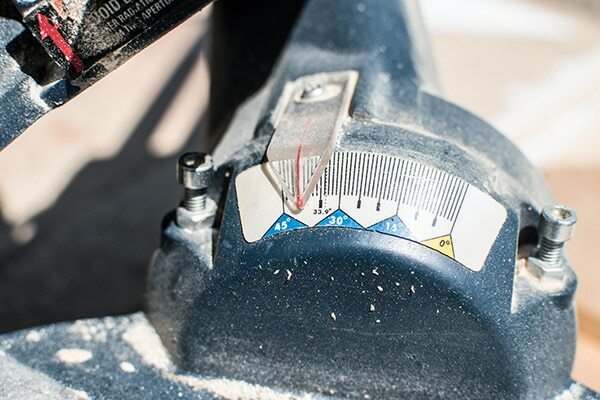 Make sure your miter saw will cut the width of the board before starting. 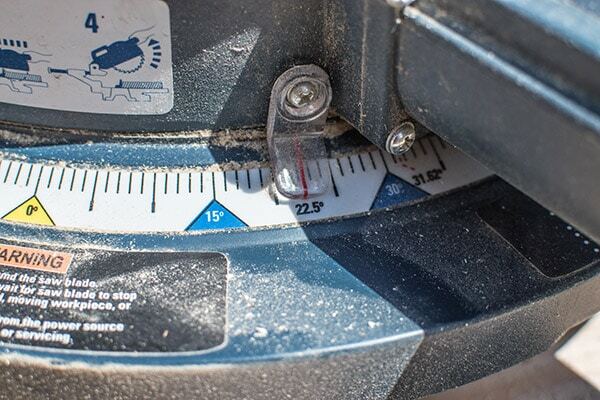 The max width on our saw is 12 inches. Adjust the horizontal angle on your saw to 22.5 degrees. Adjust the vertical angle to 40 degrees. 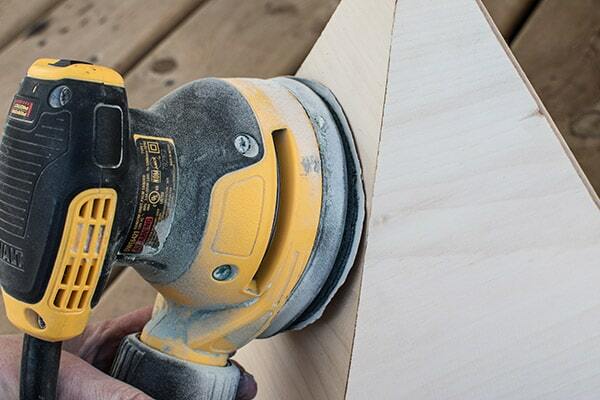 Make your first cut near the end of the board, cutting off as small a piece as possible. 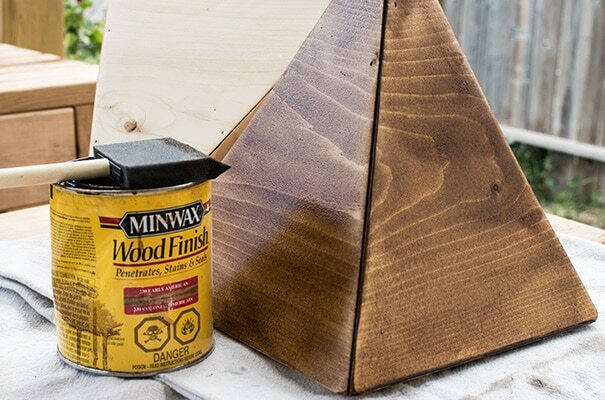 Flip the board over, and slide it under the blade so that the next cut will meet the previous cut at the edge of the board, creating a triangle at the tip. 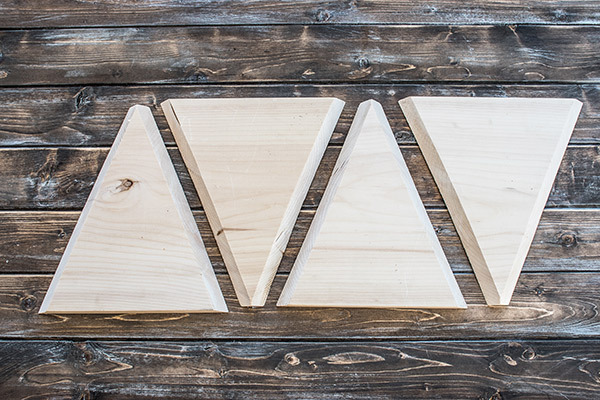 Look at the photo above, and you will see that the tip of the top of the triangle forms a perfect point, that is how you are going to cut these. Make sure your saw blade is positioned to create that tip and your cuts will be perfect. 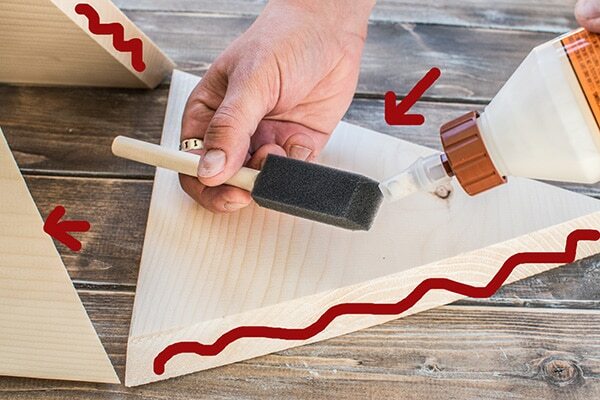 Step 4: Don’t skip the wood glue! 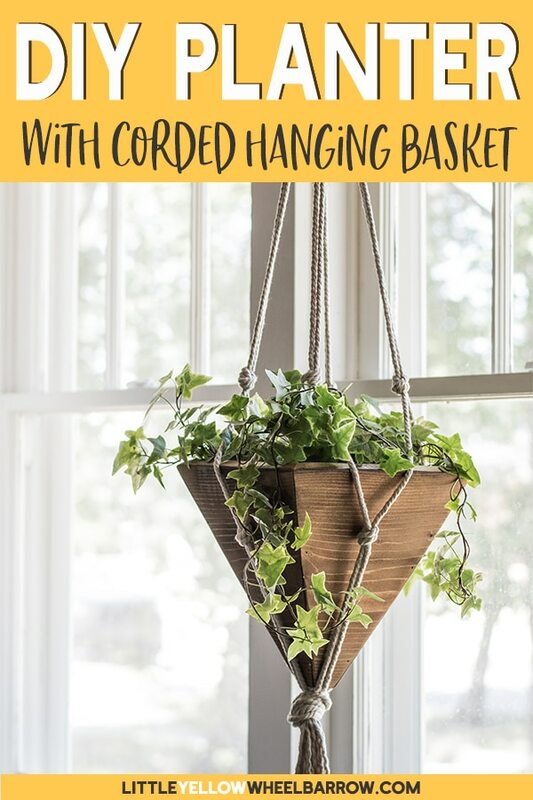 The easiest way to put these DIY hanging planters together is to find a flat surface and build it upside down like a pyramid. Once the pieces are all together, and you are happy with the way they fit, you can start to glue. Tip one side down, and add glue to the outside cuts and glue to the inside cuts for the stand-up boards. I marked on the photo below where you need to glue. Flip the board up and let it rest in place while you do the same to the opposite board. Step 5: Putting together your DIY hanging planters. Now that all the edges have glue it’s time to nail them together. It is not impossible to put them together with a hammer, but it is a bit challenging as the shape is awkward. We used our air compressor and popped in a few finishing nails on both sides of each edge. You need to be exceptionally careful when you are using a nail gun, especially if you are holding the piece getting nailed. We took our time, made sure the nail gun was placed correctly, and double checked that nothing was in the way, like a finger or a hand. It sounds more daunting then it is, but I am still wary of the air compressor and go out of my way to make sure I am not going to nail my hand to my project. Let the wood glue dry for 24 hours. Step 6: Sanding and prepping for stain. 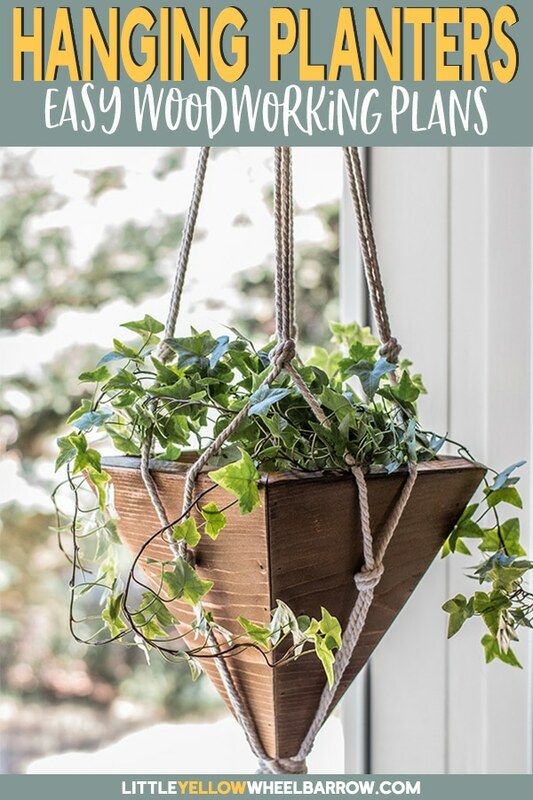 Now it’s time to finish up your DIY hanging planters. I sanded the wood with 120 grit sandpaper and then a second quick pass with 220 grit on the outside (I didn’t bother sanding the inside). Once the planters are sanded it’s time to add wood conditioner. This step is entirely optional but I used pine, and I wanted a nice even finish. I find pine sometimes stains weirdly. It often adds very dark variant colors to the wood that doesn’t at all look natural. Wood conditioner tends to even and level this out. 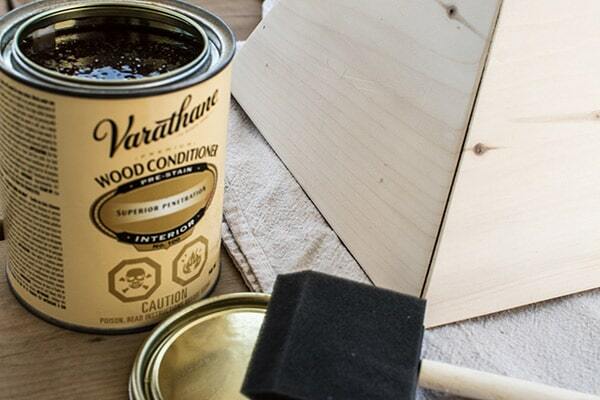 You still get the grain, but the grains tend to land in the same color family after using the wood conditioner. Let the wood conditioner dry for a few hours. I stained my DIY hanging planters with Minwax Early American. I wanted something that was a bit lighter and warmer and the Early American fit the bill. The slightly auburn color looks fantastic against the contrast of the bright green plants. I only added one coat, let it sit for 10 minutes, and wiped off the rest. Let your stain dry for 24 hours. Step 8: Indoor or out, how to make your DIY planters work in either environment. So there are two ways you can use these planters. If you want to use them outside, I suggest just adding a few drain holes to the bottom. If you want to use them inside, I would not add soil directly to the planter because they will drain directly onto your floor. I added a plastic planter that fit inside my planter that included a self-watering reservoir, so I didn’t have to worry about water leaking. 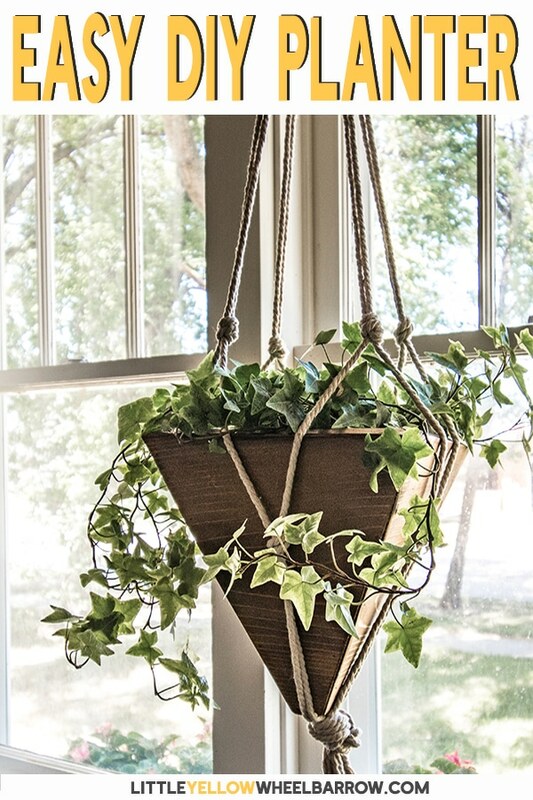 The plant in the photo is a variegated ivy, but if you are looking for a few new houseplants for your hanging baskets, you can check out this post. 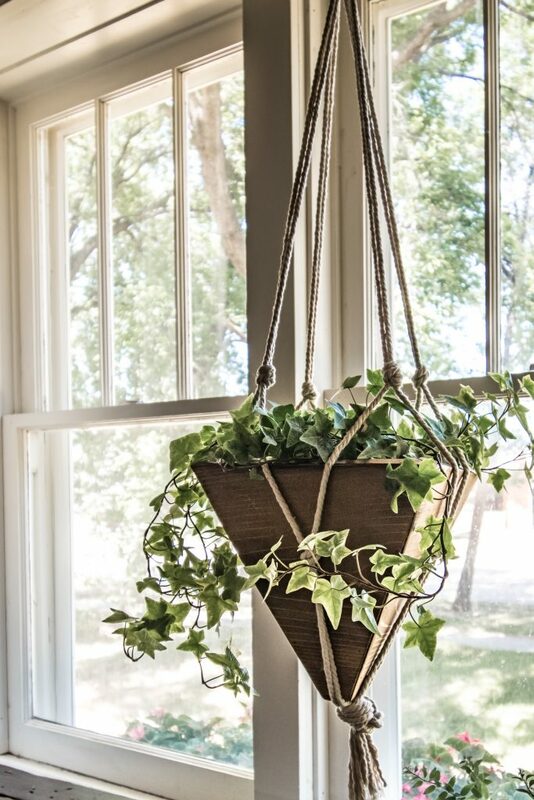 Three of my all-time favorite vining and hanging houseplants that would look beautiful tumbling out of these planters. Step 9: Making a corded hanger for your planters. Admittedly, I had no idea what I was doing with this corded hanging planter basket. 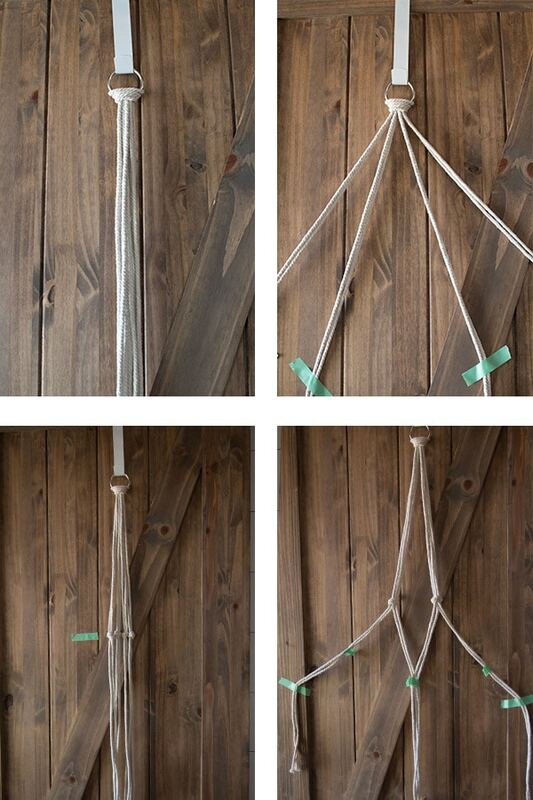 Anyone with any macrame skill could make these DIY hanging planters look so much better. I am not that person. So with no skill and no idea what I was doing I just tied knots and created a basket to slip in the planter. It worked without any unknotting or do-overs. Cut four strands 72 inches long. Fold them over once to create eight 36 inch strands that stay attached at the top. Loop your strands through a 2-inch metal ring and pull through creating a top loop. Next, divide your strands into four sets and mark the wall at 18 inches from the bottom of your metal ring. Tie off two strands together with a simple overhand loop knot. Continue to knot the three remaining sets but make sure they are all knotted at the same height. Separate your four new sets of strands. I used painters tape to tie them off to make sure I had the right ones tied. It is much easier to do then it is to explain. I measured down 6 inches from the first set of knots and tied off again using an overhand knot. Make sure they are all the same distance from the top knot. 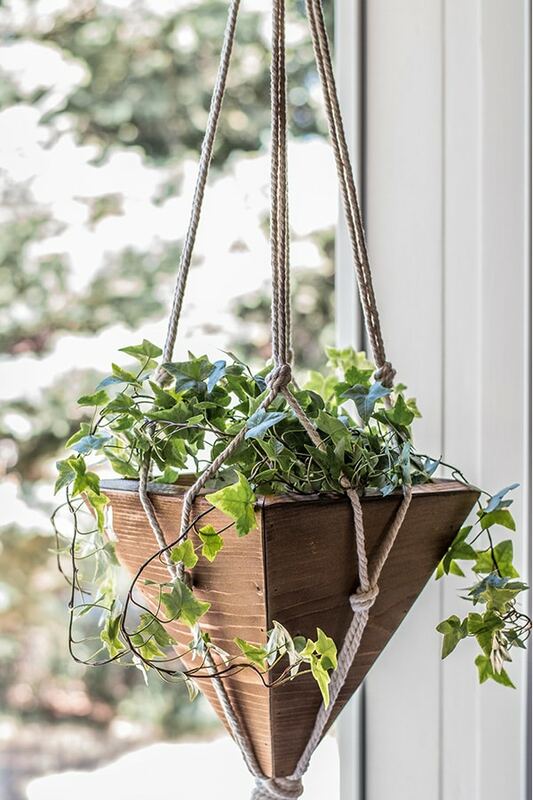 I had my husband give me a hand when I was slipping the DIY hanging planter into the cotton rope holder. Once we had it in and settled, I made a simple overhanded knot on the bottom. A bit of fraying and a pair of scissors tidies up the bottom strands. I was very pleasantly surprised that I liked my super easy macrame (we’re gonna call it that today lets pretend that it is) plant hanger. I loved it so much that you’re probably going to see some macrame (real macrame!) projects soon. 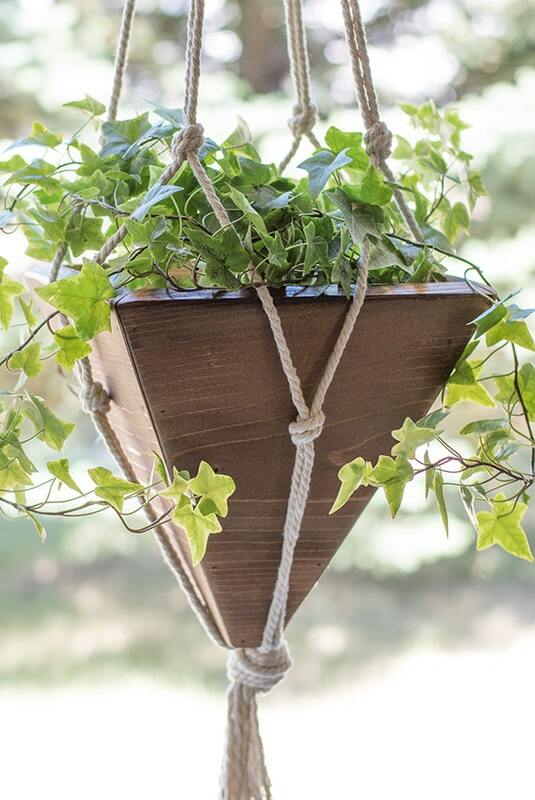 If you build these DIY hanging planters leave us a note or send in a picture! Love it! Cute Idea! I subscribed so I’m excited to keep up with your projects. Like you, I live in an old farmhouse. It needs some pretty major upkeep. Love your ideas! If you ever feel like checking out my DIY’s here’s my link! (Is it weird that I typed life instead of link?- Freudian slip?) It’s basically my life haha. Thanks for the comment, Hillary. I stalked (is it ok to say that anymore?!) your blog, Instagram and nabbed your subscription. We seem to have a lot in common. 😉 Cheers!